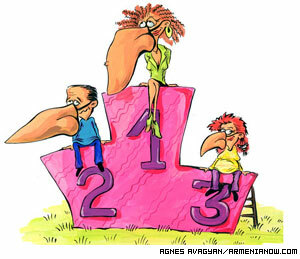 A Yerevan medical clinic is looking for “The Most Armenian Nose”. And then doctors will change it. As a publicity campaign for its services, Surb Nerses Mets medical center’s plastic and reconstructive surgery department will reward the applicant with the “most Armenian” nose with a free cosmetic surgery. The contest was announced a week ago, and so far some 200 noses have joined the competition. Department head plastic surgeon Karen Danielyan says the contest idea came from a friend who saw a girl in the hospital with a prominent nose. Organizers started out calling their contest “The Biggest Nose” or “The Most Crooked Nose”. But realizing the pejorative tone of those titles they decided to adopt the practically patriotic slogan. About 80 percent of the contestants are women, Danielyan says. Narineh Aslanyan of the center says the first question applicants ask is whether their “most Armenian nose” will be made public. Danielyan says he’ll take the winning contestant’s privacy into account, but wants to show the before and after noses, perhaps by television. If many people decided to participate at the contest being proud of their big, crooked Armenian nose then, Danielyan says, the best “Most Armenian Nose” title will be awarded to the person whose nose doesn't fit at all to his or her face. And, the doctor says that reshaping the “Most Armenian Nose” will involve making it complementary to characteristics of the Armenian face – broad forehead, big eyes, thick eyebrows. The average cost of a nose job in Yerevan is about $350-400. Three noses will be winners. First prize will get a free surgery, second prize, a 75 percent discount and third prize, 50 percent discount. Applications will be accepted through June 20. Winners will be chosen on June 21, selected by a panel of artists and show business personalities.